The building is designed to provide housing to 6,300 students of the University. Image courtesy of Acton Ostry Architects Inc. The base of the façade will be a curtain wall glazing with blue spandrel panels. Image courtesy of Acton Ostry Architects Inc. The ground floor of the building will house social and study spaces and other amenities for the students. Image courtesy of Acton Ostry Architects Inc. The structure will comprise a one-storey concrete podium and two concrete cores. Image courtesy of Acton Ostry Architects Inc.
Brock Commons Phase 1 is a student residence being constructed at the University of British Columbia’s Point Grey campus in Vancouver, Canada. The narrow and gently sloping site is located in front of Walter Gage road, adjacent to Gage Residence and the North Parkade. The building will be an integral part of the Brock Commons hub providing housing to 6,300 students of the University. Project architects Acton Ostry Architects collaborated with tall wood adviser Hermann Kaufmann on the project. The 18-storey building will have a height of 53m, making it the tallest wooden building in the world, surpassing the current 32m-high apartment building in Melbourne, Australia. Construction of the building is estimated to cost $51.5m. Construction began in November 2015 and is expected to be completed by mid-2017, while opening is scheduled for September 2017. The design of the Brock Commons Phase 1 building is inspired from a collection of international style modernist buildings located on the campus, which are simple in expression, and possess rectilinear plan forms and massing. The design is based on ‘eyes on the street’ approach. A curtain wall glazing will adorn the ground floor and floor-to-wall ceilings in the residence units will offer natural surveillance of the surrounding area. The building will have two well-illuminated entry points. A symmetrical layout has been opted for the floor plan due to limitations of the site and structural considerations in relation with the use of a hybrid concrete and mass wood structure. A metal cornice is designed at the top of the building, which is topped with pre-fininshed aluminium that appears to be floating above the parapet. The building will be a hybrid mass wood and concrete structure with a typical gross floor area of approximately 15,200m². The structural concept will resemble a concrete flat plate slab. 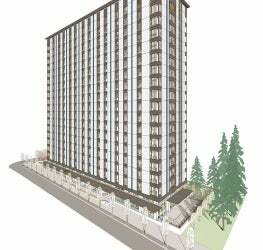 To support 17 storeys of mass timber and concrete, the structure will comprise a single-storey concrete podium and two concrete cores. The timber structure will carry vertical loads, while the concrete cores will provide lateral stability. Five ply-cross laminated timber (CLT) panels will be used for the floor structure. The panels will act as a two-way slab diaphragm as they will be point supported on glulam columns on a 2.85m x 4.0m grid. The CLT panels and glulam beams will be enclosed with gypsum board for resistance against fire. A steel connector will be used to avoid vertical load transfer through the CLT panels. A CLT canopy will run through the length of the building. Pre-fabricated sections of steel beams and metal deck will be used for the roof. The metal deck with the roofing membrane will be pre-applied to achieve quick water tightness during construction. The base of the façade will be a curtain wall glazing system with blue spandrel panels, blue accent glass and a cross laminated timber canopy. The middle section will comprise white and charcoal coloured metal panels with dark blue vertical spines and dark-framed windows with blue accent glass. The project is being constructed for housing upper year and graduate students. It will offer residence to 404 students in 272 studios and 33 four-bedroom units, as well as provide study and gathering places. "Construction began in November 2015 and is expected to be completed by mid-2017." The ground floor of the building will also comprise social and study spaces, laundry, administration and storage space for the use of all students. The ground floor and the two exit stair cores will be constructed of reinforced concrete for safety and fire-fighting purposes. To enhance the life safety further, a series of repetitive, highly compartmentalised small rooms will be constructed such that the time taken for fire to spread from one place to another is delayed. Automatic sprinkler system with back-up water supply, smoke detectors and exit stairwells with mechanical pressurisation will also be installed. The project has been designed by Acton Ostry Architects in collaboration with Hermann Kaufmann. Urban One builders is responsible for construction site management and cost planning., while Fast+Epp is the structural engineer. GHL Consultants is providing fire protection planning, whereas Stantec is involved in heating, ventilation and sanitary planning and electrical planning.